"If I'd known what a big crazy thing it would be, I would have just left it alone." offers the Special Edition version of the scene as his defense for blasting Greedo.
" When the film arrived on DVD, the scene had changed again! 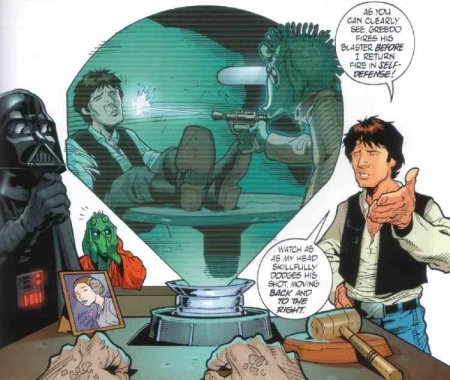 If there's one aspect of STAR WARS that rivals Jar Jar in the "fans love to complain about..." stakes, it's how the 1997 Special Edition of A NEW HOPE altered the confrontation between Han and Greedo to make the green-skinned bounty hunter fire a shot first. The reasoning behind the change was that the previous version of the scene made Han come across as a cold blooded killer - not cool like we all thought. Plus apparently Greedo was always meant to shoot first. Huh? Probably the biggest problem people had with the scene was how Greedo could miss from such close range - trying to explain it with the addition of an awkward digital head movement from Han didn't please anyone. Whilst I always preferred the original version of the scene, I wasn't going to start crying about it. One small problem I did have with the updated Greedo scene was actually to do with the reinstated Jabba The Hutt encounter, as during his chat with Greedo a line of Han's dialogue is actually taken from that later confrontation. Consequently Han says "Even I get boarded sometimes. Do you think I had a choice?" to both Greedo and Jabba. It was a minor annoyance but I was surprised the repeated dialogue hadn't been avoided somehow. Then when the "Behind The Magic" CD-ROM was released I discovered it could have been. Disc 2 of the set features some deleted scenes from A NEW HOPE, one of which is an alternate Cantina scene - this would later be included on the "Complete Saga" Blu-Ray set as well. Presented below is the confrontation with Greedo. GREEDO: That's what you said yesterday. But it's too late, I'm not going back to Jabba with another one of your stories. HAN: Yeah, but this time I've got the money. GREEDO: Then I'll take it now. GREEDO: It's too late! Jabba would rather have your ship. GREEDO (laughing): That is the idea Solo. Now you'll come outside with me. Or must I finish it here? HAN: I don't think they'd like another killing in here. GREEDO: They'd hardly notice. Get up! I've been looking forward to this for a long time. Given that some alterations were being made to the scene anyway I was surprised that Han's line wasn't changed to "I don't think they'd like another killing in here". Greedo's dialogue could be altered (where needed) easily enough. It would require a little re-editing but the end result wouldn't be that different. Maybe there isn't a decent recording of the line or maybe it was felt the dialogue was better as it is - which would explain why it was changed in the first place. With the arrival of A NEW HOPE on DVD the film received some more visual updates, including another version of Han and Greedo's little shoot-out. Now Han and Greedo fire more or less at the same time (fan examination revealed Greedo beat Han to the draw by a couple of frames). Also, Han now avoids Greedo's blast by leaning his body to the right, rather than the funny head movement from the Special Edition. Many fans conceded that if Greedo had to shoot first they were happy it now looked better. The 2011 Greedo Scene: For the Blu-Ray release of the film, the scene remained roughly the same as the DVD. Despite talk that the gap between blasts was even shorter, it appears that the only change was that the above shot was shortened so Greedo's blast comes sooner after the cut. A flash. But is it going towards or away from Han? A second flash. Has Han only just fired? 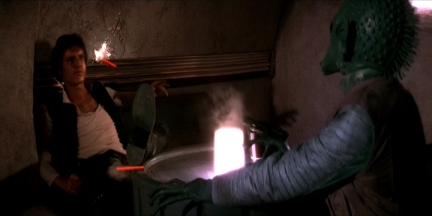 When fans were told, after witnessing Greedo's added blast in the Special Edition, that he was always meant to shoot first they were understandably confused. How hard could it have been to add one more blast? Around the time the film came out on DVD, George Lucas started mentioning in interviews that Greedo had always shot first but due to an editing error this wasn't really noticeable before the Special Edition. I forgot all about it, then one day I stumbled across a topic on a message board saying it was true: Greedo really did always shoot first. Following a frame-by-frame analysis of the pre-Special Edition scene, someone had found something to prove Han had in fact only fired after being shot at. This claim was based on the fact there were two flashes - presumably one from each character's blaster. It was an interesting bit of info. I went back to my work. I started to wonder if it was true, it could just be a wind up. Ah what did care, I... I... wasn't getting any work done. Maybe I should... no, no, back to work, I'm not sad enough to... It was no use, I wouldn't be able to concentrate untill I'd checked it out myself. I sighed but figured if true, at least I could write something about it. So is it true? Well there's certainly evidence for it as you can see in the column on the left. That first flash could be from Greedo's blaster and the second flash could be from Han firing his. On the other hand it could be that the first flash is from Han's and the second flash is simply the blast continuing on it's way to the target. Even if Greedo did shoot first I'm sure many people would prefer to have this version of the scene back in the film purely because it doesn't look like he did. 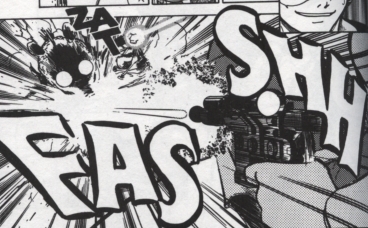 So who shot first in the Manga adaption? Originally this was two articles, "Did Greedo Always Shoot First?" and "The Original Greedo Scene", both written early 2005. On 14th March, 2005 these were combined and rewritten slightly as well as adding some pictures and information about the Special Edition and DVD versions of the scene. 7th June, 2007: A sentence mentioning a pre-1997 version of the scene was unavailable on DVD was removed, following a DVD release in 2006. 30th September, 2011: Added Blu-Ray info. 10th December, 2014: Added George Lucas quote. Interesting stuff. I always thought there was a little frame jump somewhere.